This was Challenge #90: And here’s the answer: Copyright Â© 2007 Barrie Brewer, Nikon D50, 18-200VR, 1/500s shutter, f/16 I took this photo of Buzz Lightyear at Disney’s Hollywood Studios, during the Stars and Motorcars parade. Buzz travels around the world quite a bit. There was really no way to tell from my clue exactly … Continue reading "Where in the World #91"
Copyright Â© 2008 Barrie Brewer, Nikon D300, 1/60s shutter, 4, ISO 3200 My favorite interactive attraction (our theme for Pic of the Week this week) is Buzz Lightyear’s Space Ranger Spin in the Magic Kingdom, but not for the reason you might think. For the past couple years, instead of trying for the highest score, … Continue reading "The Evil Emperor Zurg"
The Buzz Lightyear Audio-Animatronic in the Magic Kingdom.Nikon D70/18-200VR, 1/40s, f/5.3, ISO 640, EV -0.3, 95mm Focal Length The Audio-Animatronic Buzz Lightyear in Buzz Lightyear’s Space Ranger Spin interactive ride in Tomorrowland briefs the hundreds of new Space Ranger cadets daily on the mission to save the universe from the evil Emperor Zurg. 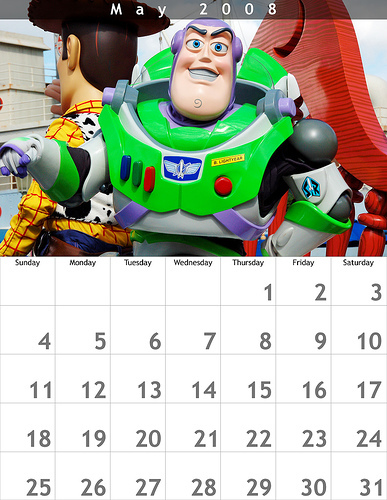 To get … Continue reading "Buzz Lightyear: Space Ranger"
If you read my December 25, 2007 blog, you know that my holiday gift to you is that each month I will post a photo calendar page that you can print out and use at home or work during 2008. This photo of Buzz Lightyear was taken during the Stars and Motor Cars Parade at … Continue reading "Focus on Disney World – May Calendar"